Set in the heart of Budapest, these executive apartments are within walking distance of endless things to see and do in Hungary's vibrant capital. The hotel is just moments away from Vaci Utca, Chain Bridge, the Danube River and Freedom Square. These fully furnished hotel apartments feature a full kitchen, flat-screen TV's and plush bedding. After a day of exploring the city, work out at the well-equipped gym or relax at the plunge pool. 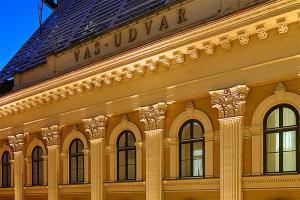 Approximately 12.5 miles from Budapest Airport; walking distance to the Chain Bridge. The nearest subway station is Deak Ter.